FOLLY: I didn't believe that this place existed when Nosa mentioned it. In my mind, he had "come again" with all this food adventure P. I just wanted to get a Toastie and go to Hans & Rene but my dear friend here was up for adventure and reviews, needless to say, he won. NOSA: Well, I found out about this place from Twitter. Part of my morning routine involves searching for mentions of "eat drink lagos" to feel what the streets are saying and a nice lady wanted to know what EDL thought about Pizza Marella. TL;DR - Bat signal went off. FOLLY: FYI, this place isn't a restaurant. It's a shawarma spot in the driveway of a shopping complex that also sells pizza. NOSA: The lowkey-est of spots. FOLLY: For what it is, Pizza Marella has decent customer service. The waitress carried a table for us into the shade when we arrived because like I said, it's in the driveway of a shopping plaza they can't have any tables in the way cause cars need to drive out. Secondly, the Lebanese man that we think is the owner went looking for a carton to put against the bars in the fence to create even more shade for us cause the sun was pretty harsh. NOSA: He IS the owner and he might be the most pleasant man ever. FOLLY: We ordered the Pizza Marella. It has chicken, sausage, pepperoni, and tomato. NOSA: It's named after the spot so it has to be good, right? Fun fact: Our favorite pizza at La Taverna is Pizza Taverna so it's no surprise that we went for the eponymous pizza. FOLLY: I appreciated the freshness of the tomato - the redness really jumped out at you on the pizza. The sausage wasn't what I was expecting, I was expecting sausage meat in dollops and the pepperoni was of decent quality. NOSA: The dough wasn't all the way "ready" in the sense that it wasn't quite done. It wasn't a problem on first bite, but on subsequent bites it hit me and I realized pizza shouldn't be so chewy. FOLLY: I did enjoy the stringiness of the cheese, you don't always get that with La Taverna's pizza but as Nosa mentioned there was that chewiness to the dough that we didn't like. NOSA: The dough issue was a bit of a problem for me because "medium rare" pizza is definitely NOT a thing. FOLLY: The pizza was good but the surroundings give Pizza Marella a zero for ambiance. I can get pizza that's equally as good and possibly better in a nice environment at Pizza-riah or La Taverna so based on that I'd probably not visit Pizza Marella again. NOSA: It's better as a take-out thing to be fair. 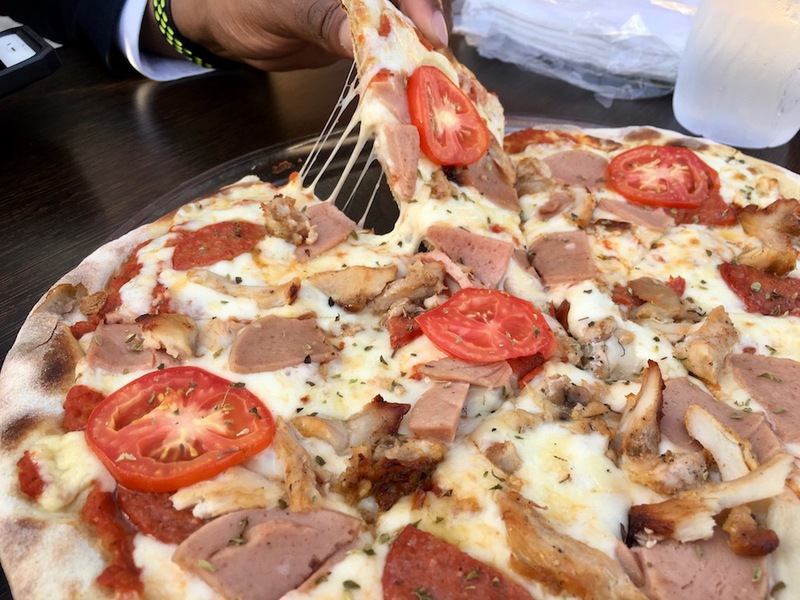 If you're a pizza "purist", you'll definitely go with this over Debonairs or Dominos.